Paul Klee, a graphic artist and painter born in Bern to a Swiss mother and a German father in 1879, created artworks that were quite hard to classify. His works were a bit personal, often humorous in a gentle way and teemed with allusions to poetry, music and dreams. Klee’s canvases, consisting of delicate drawings, watercolors and paintings were often small, which, more often than not, seamlessly blended children’s art, cubism, surrealism and primitive art. Growing up in a musical family, he was a violinist but chose to pursue art and entered the Munich Academy at the age of 21. While still in school, he toured Italy and was specifically drawn to Byzantine and Early Christian art. The early works of Paul Klee were pen-and-ink drawings and etchings mostly. Subjects combine surreal, grotesque and satirical elements. Some revealed the influence of two artists he admired, James Ensor and Francisco de Goya. Klee also had the penchant for giving his works evocative and peculiar titles, just like these two popular etchings of his, created in 1903. One was entitled, Two Men Meet, Each Believing the Other to Be of Higher Rank. The other was named Virgin in a Tree. Oftentimes a deeper meaning is evoked by the titles he gave his works. After his marriage to Lili Stumpf, a pianist, he settled in Munich, the city that was associated with avant garde art during the early 1900s. In 1906 he had his first exhibit of his etchings. He also developed a close friendship with August Macke and Wassily Kandinsky, which drove him to join the expressionist group, The Blue Rider (Der Blaue Reiter), a proponent of abstract art. His work took a different path after a visit to Tunisia with Louis Molliet and Macke in 1914. He was so mesmerized by the intense light he saw there prompting him to say that color had possessed him so he no longer had to chase it. His compositions during this period consisted of colored squares reminiscent of the radiant mosaics he saw in Italy. One fine example of his work during this phase was a watercolor entitled Red and White Domes that he created in 1914. 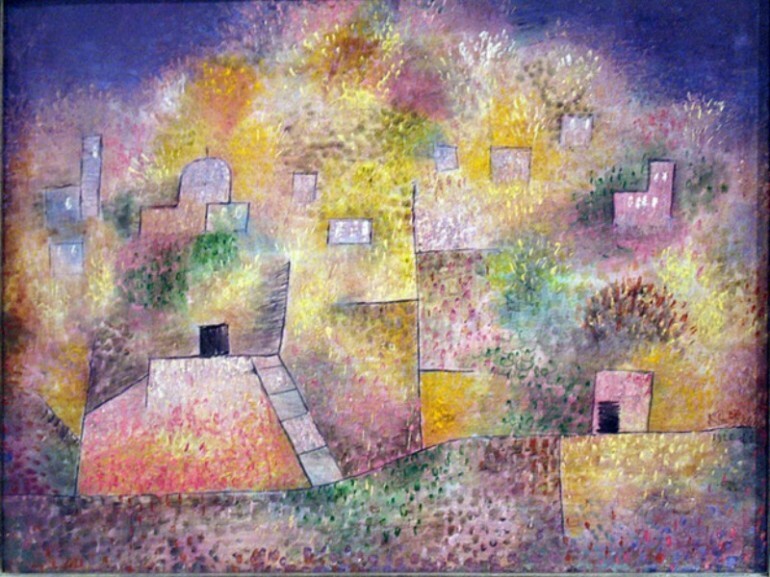 Klee was an artist who was very inventive in his techniques and use of media. He incorporated numerals and letters in his paintings, such as in Once Emerged from the Gray of Night (1917-1918). He used a complex language of signs and symbols that came from the unconscious. Color and lines predominate his works although mosaics and other effects were also part of his canvases. Paul Klee was not only an artist. After the First World War, he taught at the Bauhaus School together with Kandinsky. He wrote a book, The Thinking Eye, during his days at Bauhaus. He also wrote several essays dealing with art theory. He was very productive during the 10 years that he taught at Bauhaus, producing nearly 10,000 small-scale drawings and watercolors. He also briefly taught at the Dusseldorf Academy in 1931. In 1933, he went to Switzerland but he developed a rare disease called scleroderma. The debilitating disease forced him to change into a simpler painting style, characterized by heavy black lines, which reflected his thoughts on war and death. It was said that his last painting called Still Life (1940) was a summary of his concerns during his lifetime. Klee’s work is difficult to define. He had a period when he created abstract patchworks of color that looked like mosaics. He was also known for using stick figures, like children’s drawings but with deeper meanings. He incorporated arrows, eyes, moon faces, and suspended fish in some of his works. His view of the world around him was truly different. Some of his works were magical and inventive with a hint of fantasy and primitiveness. He was an artist that was regarded in the same rank as Kandinsky, Picasso and Matisse. He was influential in the works of modern abstract artists such as Miró, Rothko and others. Music played a part in his works, with the repetitions, the gradations of value and color, the stacked forms, changes in motifs and a counterpoint. 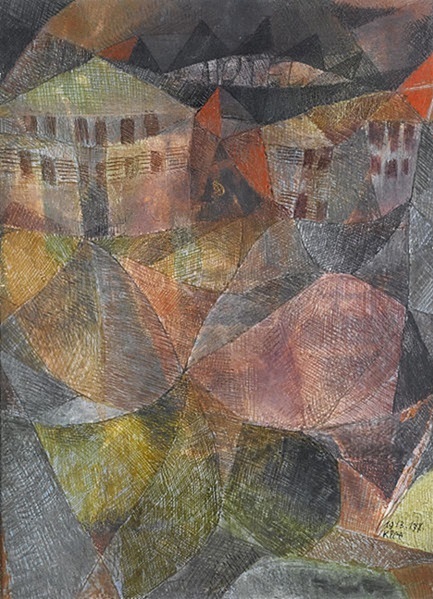 Paul Klee was a painter whose canvases continue to reveal so much about him.